The Eight of Cups tarot card represents a period in the Minor Arcana when the things we own, have wound up owning us. We have grown unsatisfied with our progress, with our goals, and feel the need to escape the gilded cage we’ve built. All of our accomplishments have finally amounted to nothing, leaving us emotionally unfulfilled. 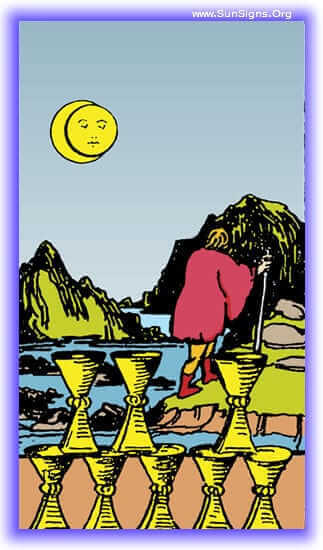 The Eight of Cups appears in the tarot reading reflecting our lack of satisfaction with life and all we’ve obtained. This card will often appear when we are ready to abandon the rat-race and head for the hills. Through all we’ve accomplished, we are left with the feeling that the only route left is escape. Eight of Cups upright corresponds to some change in your outlook. You would be able to let go some strings of the past which have turned outdated at present. So, this card signals a turning point in your life. As this is the time to move forward in life, you should evaluate your current scenario and then decide accordingly. At times however, you may feel a bit down as you realize that you have made a wrong move. Nevertheless, you will realize that things aren’t always what they seem from the outside. Thus you would be able to shun situations and things that no longer work for you. A deep dissatisfaction has been upon you, every piece of the thing you have accomplished serving to remind you that it just hasn’t been as fulfilling as you’ve hoped. You’ve been escaping in any small way you could find, but none of it has set you free. Ennui is your greatest enemy, boredom, malaise. Nothing satisfies, and all that you’ve built is just a testament to futility. This is often the result of having given too much of yourself. The feeling you’re experiencing is that of burn-out. You’ll need to spend time in rest and repose before you can successfully move on. You’re trucking along powerfully right now, giving everything you can to your current projects. But be warned, with the engine burning full steam you’re heading towards a massive blow-out. Take some time for yourself before it’s too late. No, now is not the time to move forward, instead you should take time in repose and let this situation rest before trying to approach it again. The Eight of Cups reversed represents a desire to explore new options, new choices, but you are filled with confusion about which options are the best for you. There is a hopelessness about you, an aimlessness that leaves you feeling as a bit of an outcast. As an added trouble, you aren’t really facing your troubles, you hide in every available escape. 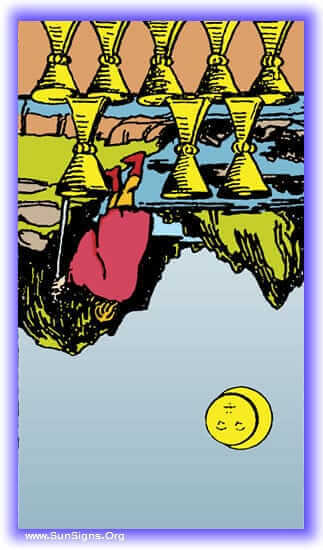 Eight of Cups in the reversed position symbolizes impatience and haste. You have a tendency to come out of your cocoon of security to pursue an impossible dream of yours. You have high flights of the imagination and boast of the ability to take risk. However, you tend to live under threats and refuse to admit negative circumstances. Also, you are likely to put restraints in your own path of following your dreams. You often persuade yourself to stay happy with whatever you have rather than asking for more. All this add up to refusing the happiness which would have come to you otherwise. An aimlessness has been upon you, and because of that you’ve been spinning your wheel for a good long while. A lack of connection to your goals has made the last few months utterly without progress. You’ve been plagued with a lot of confusion and aimlessness, not really knowing what you want to do with your life, or which of your many options you should take. Rather than thinking about them, you’ve been hiding. Get your head out of the ground! You’re avoiding dealing with the issues that are currently ahead of you. You still have time. But with your current course of action you’re going to wind up burying your head in the sand, overwhelmed by the options in front of you. Take action now to prevent this eventuality. Yes, you need to pull your head out of the ground and move forward. There are options ahead of you, and you should take them!